Having a well-stocked kitchen and pantry is a powerful tool that can save you time, money, stress, and keep your weight in check! Make sure your kitchen is stocked with these 5 essentials, and with some planning and creativity, you’re bound to be able to whip up a great meal that will help you slim down without missing out on flavor or nutrition. Don’t dismiss the frozen vegetable aisle in your local grocery store! Frozen vegetables are flash frozen at harvest and can be nutritionally superior to their fresh counterparts in nutritional value. Take advantage of the latest trends in the frozen vegetable world (cauliflower rice, broccoli rice, or zucchini noodles) or stock up on old favorites (frozen chopped spinach, or mushroom and pepper blends). A wide variety of ready-to-steam or microwave-friendly packaging are available and can make your life much easier when it comes to meal prep and menu planning. Try this as a low carb alternative to fried rice: cook frozen cauliflower rice according to package directions. In a skillet, sauté chopped scallions with garlic, ginger, peppers, and soy sauce. Add the cauliflower rice and scramble an egg into the mix. Season with salt and pepper and enjoy! Herbs and spices pack a punch of flavor and nutrition without adding sugars into your day! 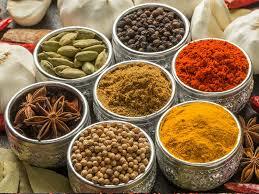 Try adding warm spices such as cinnamon, nutmeg, and turmeric in your rubs and marinades. Dried oregano, Italian seasoning, and herb de Provence are a great addition to your salad dressings. On cold winter nights, steep fresh mint with slices of lemon and ginger for a soothing immune-boosting tea. Alternatively, infuse your cold water with your favorite fresh herbs for a refreshing drink on hot summer days. If you have a green thumb, plant fresh stevia in your garden and add the leaves into your drinks for a hint of sweetness. Spices and dried herbs will lose their flavor and aroma over time so it’s best to buy spices in small quantities and replenish them as needed. So, go ahead and clean out that spice cabinet and throw out those containers that have been sitting there since last year! If you want to take it a step further, invest in a spice grinder or use your coffee grinder to grind whole spices in small batches. Make sure to check out the ingredient list and avoid spice blends that may contain added sugars. We’ve all heard about apple cider vinegar’s multitude of health benefits, and that’s no surprise! This ancient remedy has been used for generations to promote healthy digestion, aid in liver detox, and boost immune function. Use apple cider vinegar to marinate your meat or mix it with extra virgin olive oil, salt, pepper, and your favorite herbs for a quick and easy vinaigrette. You can also use it to make a quick pickle by submerging thinly sliced cucumbers, radishes, or red onions in apple cider vinegar for 15 minutes. It’s no wonder the Mediterranean diet is touted as one of the healthiest in the world! One hallmark of that diet is its reliance on high quality extra virgin oil. Getting most of your daily energy from healthy fats such as extra virgin olive oil or avocado oil will curb your cravings, improve your mood, and drive your body into fat-burn. Not to mention your foods will taste great! Avoid highly processed oils such as canola oil, corn oil, and vegetable oil. Extra virgin olive oil is rich and robust in flavor but has a low smoke point so its best not to use it for high heat cooking. Avocado oil has a mild flavor and is very versatile. It has the advantage of having a high smoke point, making it ideal for almost any cooking method. Keeping your kitchen stocked with ready-to-go proteins will ensure that a flavorful meal that’s healthy for you is only minutes away. Some great options include canned tuna, sardines or salmon, which you can add to salads or lettuce wraps. 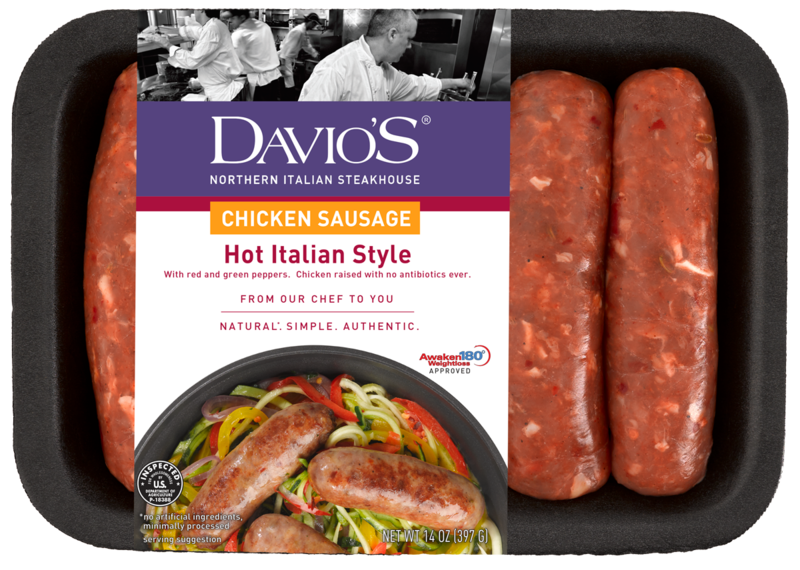 Prepare a quick and easy high protein weeknight dinner using convenient options such as Davio’s Chicken Sausage, frozen shrimp, or frozen burger patties. Next time you go food shopping, make sure to add these items to your grocery list and make them staples in your home kitchen!